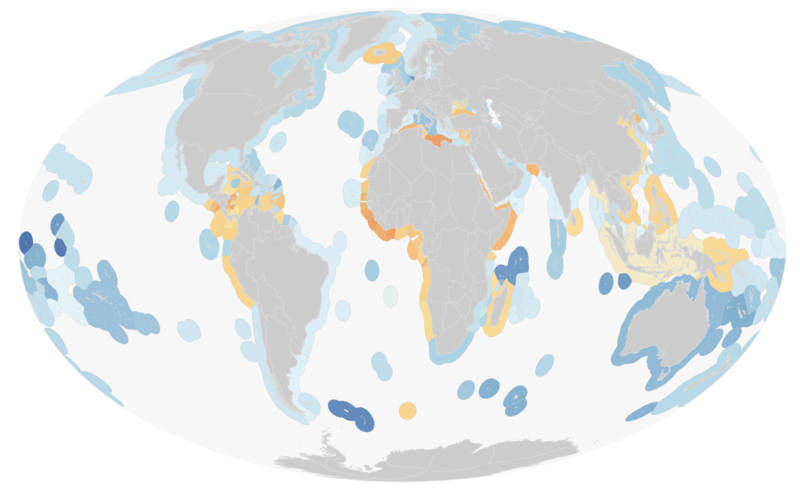 A significant portion of my work on the Ocean Health Index (OHI) involves working with raster data, a specific type of spatial data where values are held in grid cells. The data I work with varies from high resolution, remotely sensed data on sea surface temperature to coarse, modeled data on global fish catch. When I was working on the global assessment, I dealt with raster data at a global scale. Now that I am working on a regional assessment in the US Northeast, I often need to use the same data from the global assessment but cropped to my regional scale. Since I know I am not the only one doing this (we currently have over 20 OHI+ assessments occurring around the world), I wanted to share my process for making our global raster layers usable at regional scales. The packages you will need are raster, sf, and dplyr. Throughout this post, I’ll use the packagename::function nomenclature to identify which package functions come from. For this blog, I will use a raster that contains global mangrove data. This file is too large to store on our OHI-Science GitHub account, where most of our OHI data is held. Instead, it is stored on a server at NCEAS and can be downloaded here. This is a slightly modified version of the “MFW, Mangrove Forest Cover Loss since 2000 in areas with year 2000 Mangrove Forest” dataset from: Hamilton, S. E., & Casey, D. (2016). Creation of a high spatio-temporal resolution global database of continuous mangrove forest cover for the 21st century (CGMFC-21). Global Ecology and Biogeography, 25(6), 729-738. doi:10.1111/geb.1244. The raster data is provided at a 30 meter resolution, which is awesome, but it can be difficult to work with due to its large size and time required to process it. To alleviate this problem, we created a ~500 meter resolution raster and converted it to the Mollweide coordinate reference system. The units for these data are area of mangrove per cell in square kilometers. Consequently, summing the raster cells in a region will provide the total area of mangrove forest in km2 (cell values range from 0 to 0.274979). The R scripts we used to estimate mangrove extent and trend are available from GitHub. These data could be useful for estimating mangrove cover in regions without local mangrove surveys. I have downloaded this data onto my personal computer and saved it in a folder called big. Let’s first take a look at the downloaded mangrove data. Since mangroves tend to be limited to coastal regions at tropical latitudes, it is difficult to make sense of this data when visualizing it at a global scale, even when I make all cells black in color. This is also due to the high resolution of the data. Can you see the dots!? 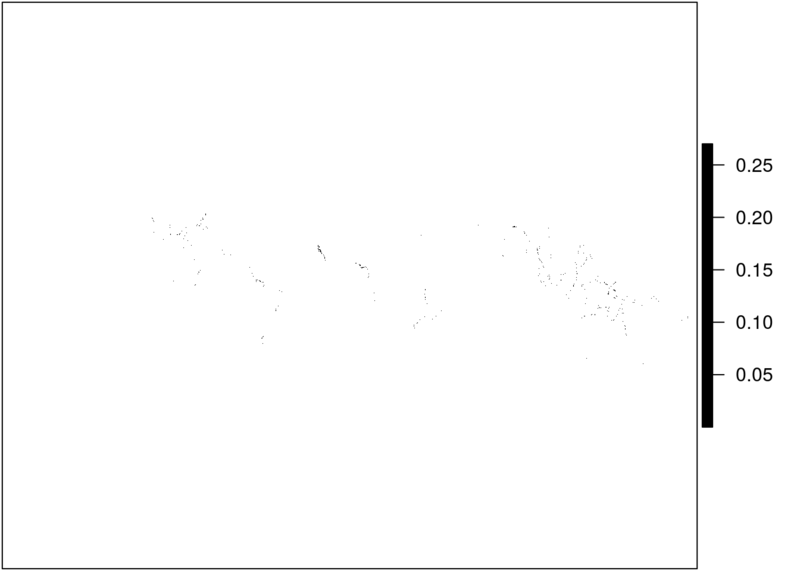 ## I've saved this raster in a folder called `big` on my personal drive. You will need to replace this file path with where the file is located on your own computer. Fortunately, R gives us some options to explore the data more closely. We can zoom in using raster::select() to make more sense of the speckles we see currently. The select() function allows you to select an area on the plot with your cursor. By saving your selection to a variable (in our case s) you can then plot just that piece of the raster. OK that looks more like it! We provide a shapefile of 240 global regions including country exclusive economic zones (EEZ) and high seas regions. You are able to load it and select the country(s) of interest for your analyses. This is useful for anyone that wants to use data provided at the global level, but cropped down to a region of interest. You can download the shapefile here. Again, this file is too large to host on GitHub so I will download it onto my personal computer and save it in the big folder. Once downloaded, you will have two different regions files, one in a Mollweide projection and one in WGS84. You can select whichever suits your needs. If you need more information on coordinate reference systems see here. 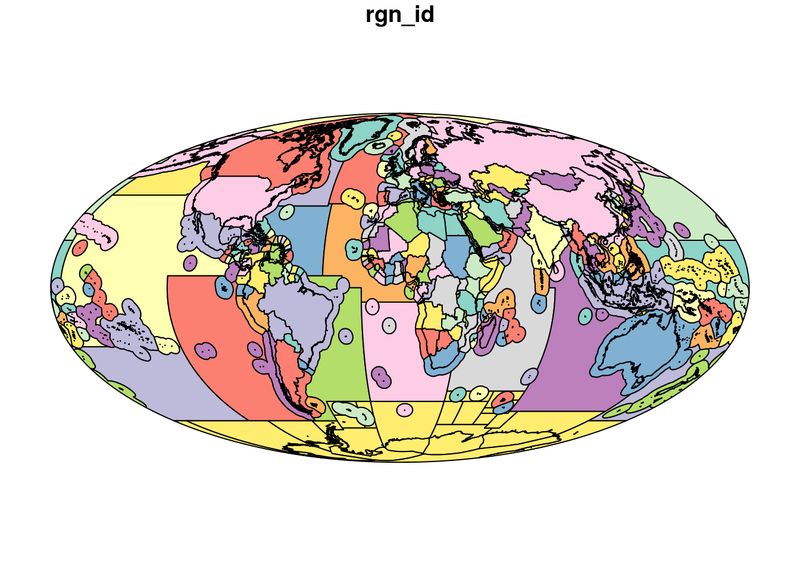 Since the mangrove data is already in a Mollweide projection, we will use the regions file in the same projection, regions_mol. I am going to use the function st_read() to load the shapefile. This comes from the sf package and is a preferred method of loading and working with spatial data as opposed to using readOGR() from the rgdal package. The st_read() function will read in the shapefile as a simple feature object, meaning the spatial information is stored in a dataframe. This allows you to use data wrangling tools such as dplyr to work with the data. The regions object is a simple feature with an attribute table in the form of a dataframe that lists some important variables including the type of region (land or EEZ), name, our OHI three-letter key, and total area. OK this looks like what we want! For the sake of demonstration, we are going to use Bangladesh as our region of interest. Since we loaded the shapefile as a simple feature object, we can now select Bangladesh using dplyr::filter(). When we plot our new object, we see there are two distinct polygons included - the land (lime green) and (teal) eez polygons for Bangladesh. This looks like what we want, so I recommend saving this object with st_write() to use in other parts of your analysis. 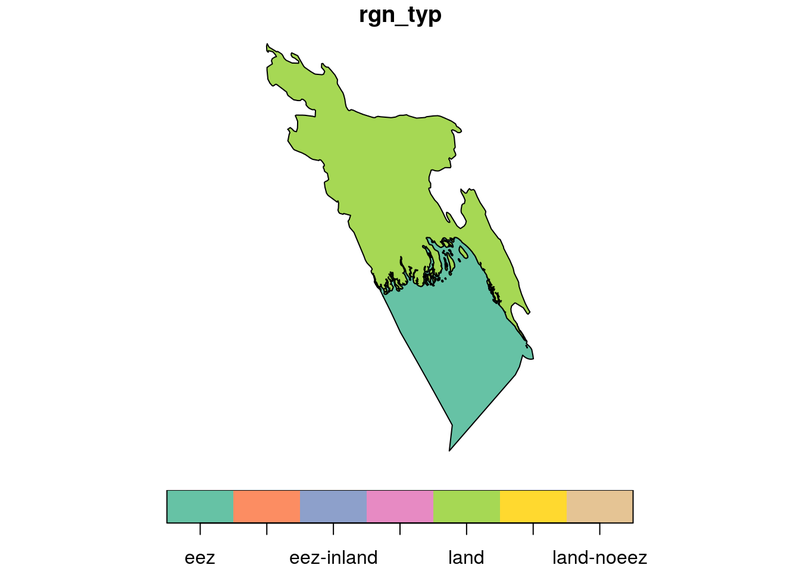 Unfortunately, rasters (our mangrove data) do not yet play nicely with simple feature objects (our region shapefile), so we need to convert the bangladesh object to a SpatialPolygonsDataFrame. This is done using as(). You pass your simple feature object - in our case bangladesh - to as() and tell it to convert to a Spatial object. This returns the same polygons but as a SpatialPolygonsDataFrame. In a SpatialPolygonsDataFrame, attribute data is stored as a data.frame in the data slot, but the actual geometric features are stored in a polygons slot. This structure can be confusing to work with but until the raster package improves compatibility with sf objects, it is necessary to use SpatialPolygonsDataFrames with the raster package. You can see that bang_man is a scaled down version of the mangrove data, only showing us what mangrove data exists within the bounding box of the Bangladesh polygon. To remove the data that falls outside of the country boundary, we now need to use raster::mask(). This function uses a SpatialPolygonsDataFrame as a “cookie cutter” and keeps only the raster data that falls within the polygon. Now that we have the data we want, mangrove data for Bangladesh, we can save this data using writeRaster(). For a more thorough tutorial on working with raster data see my Intro to Spatial Analysis in R.